Pinky Pudding stayed up all night baking and is ready for the PARTY! She wishes to send Holiday Cheer to everyone far and near! Whether your loved ones are present or living in the great beyond up in the sky, Pink Pudding hopes your heart is warmed by all of the love around you, seen and unseen. This post concludes my DT for Tiddly Ink's 2016 Season! I have loved crafting and creating! Thank You for taking a moment to pop by! Happy Near Year and Happy Holidays to You! 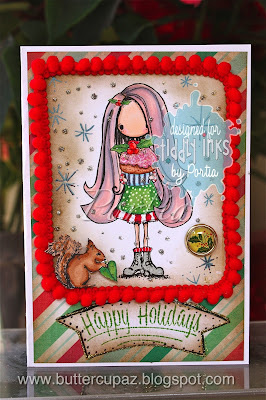 Check out the Tiddly Ink's Very Merry Christmas Challenge!